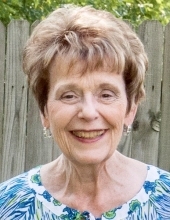 Leora Louise Yeaman Simmons, age 81, lifelong resident of Ponca City, Oklahoma, passed away Friday, February 1, 2019 in Ponca City. A memorial ceremony to celebrate Leora's precious life will be held at 11:00 am, Saturday, February 9, 2019 in the Worship Center at the First Baptist Church with pastor Michael Taylor and associate pastor French McLemore officiating. Leora will be laid to rest privately at Longwood Cemetery east of Ponca City. Funeral arrangements are under the direction of Trout Funeral Home & Crematory. Leora was born on August 25, 1937 to Morris Colton Yeaman, Sr. and Alice Ogle Fry Yeaman in Ponca City, OK. graduated with the Ponca City High School class of 1955. Shortly after high school, Leora married David Earl Simmons on June 5, 1955. They remained inseparable for 63 years. Their marriage was blessed with two children. Early in their marriage, Leora was a legal secretary, and later worked alongside David at Simmons Lumber Company. Leora, along with her daughter, also owned and operated Applecart Catering for a number of years. Leora’s life was most defined by her service and giving toward others, a value based in her strong Christian faith. It showed in her hospitality at First Baptist Church, caring for her church family by cooking and serving those less fortunate through the church. Leora was a founder of the McCord Senior Center in Osage County, and spent countless hours volunteering her time there. After moving to Creekside Village, Leora was well-known for looking after and helping other residents who needed assistance. Leora enjoyed playing bridge, getting crafty with her various art projects, and spending time with her sorority sisters of the Beta Sigma Phi sorority. All who were fortunate enough to have known Leora will remember being inspired by her bright and positive outlook and her ever-present smile. Survivors include her dear husband of 63 years David Simmons of Ponca City, beloved children: Kelli Love and husband Mark of Ponca City; Scott Simmons and wife Brenda of Atlanta, GA, adored grandchildren: Kyle Enevoldsen and wife Leila of Olathe, KS, Kami Stroope and husband Griffin of Dallas, TX, Hannah Simmons of Santa Monica, CA, Mason Simmons of Denver, CO, beloved Nephew, Kevin Yeaman of Pattaya, Thailand, sister-in law Lisa Yeaman of Natchitoches, LA, cherished great grandchildren; Sullivan Stroope, Rosie Stroope, Jojo Stroope, and Aaron Enevoldsen as well as close family member Peggy Yeaman of Ft. Worth, TX, and dear friends Barbara Feil and Glenda Brown of Ponca City, OK.
Leora was preceded in death by her parents and brother Morris Colton Yeaman, Jr. and her son-in law Kent Enevoldsen. The family would like to give special thanks to the staff at Creekside Village, Via Christi Village, and Humanity Hospice for the boundless love, care, and compassion they gave to Leora over the past two years, and particularly the last few months of her life. Memorial Contributions may be made to Humanity Hospice, 1109 N. Bryant Ave., Edmond, OK 73034 or the Alzheimer's Association, 225 N. Michigan Ave., FL 17, Chicago, IL 60601, www.alz.org . To send flowers or a remembrance gift to the family of Leora Louise Simmons, please visit our Tribute Store. Northeast Corner of Longwood Road and East Hartford Ave.
"Email Address" would like to share the life celebration of Leora Louise Simmons. Click on the "link" to go to share a favorite memory or leave a condolence message for the family.